Beautifully stylised and helplessly satirical, Singh’s oil works appear to be preoccupied by the absurdity of social notions of rest at a time of incredible unrest. 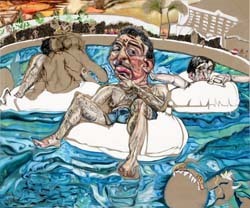 Singh’s large scale paintings on linen depict figures of leisure wrestling with the oddities of the artificial water pool and inflatable rubber rings. Mocking them for their idleness, Singh depicts a landscape as far removed from reality as appears possible and in so doing draws attention to possibilities of social escape during a time of heightened violence. The Lazy River is an amusing work of tired and exhausted figures haplessly floating as they rest upon inflated clouds of white cushions. Singh paints some of the absurdity and tormented anguish that hides beneath her holiday makers as they attempt to forget themselves in the tranquillity of their new found pleasures. In Singh’s works, the false security suggests her subject’s futile pursuit for happiness. 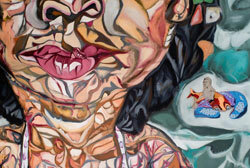 Annie is a work in which a figure appears to plunge into the water behind a distorted face pressed to the canvas. The unresolved figure stretched out on the undulating water appears to have been borrowed from recent culture and suggests that Singh is commenting on the current state of affairs. The Dreamer is a work that recalls the routine of hotels, including the towel, the lounger and the pool exercises. Animated side by side these larger than life men of leisure push up against the water as they are instructed to turn and thrust through the water while the sun pours over them. These figures are riddled with unresolved faces that appear to float in between them on the water. 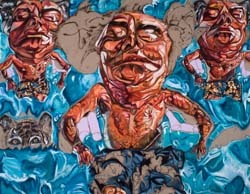 Singh’s main subjects in the water appear to be replicas of each other. 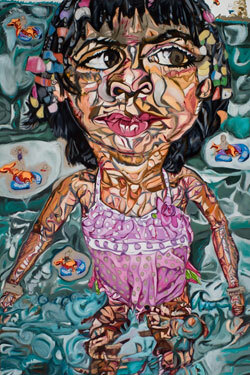 Neha is a large scale work of a girl standing knee deep in shallow waters, with a recurring logo of a small lobster floating over the canvas. Singh’s figure appears to resemble a mosaic, composed of varying shapes and fragments of colour pressing against each other to formulate her face and body. Unfortunately Singh’s figure appears more perplexed than relaxed and as with all her stylised characters resting in these shallow waters, the audience are almost invited to laugh at the absurdity of these cumbersome individuals seeking solace in their artificial surroundings. “Where does she even start?” an awed woman asked as she stood face-to-face with one of Schandra Singh’s massive, muscular, oil-on-linen portraits last Friday evening at the opening of the artist’s new solo show, “If I am Immune To It, I Don’t Deserve To Be Here,” at the Bose Pacia gallery in DUMBO. For Singh, whose sylphlike frame belies the intense physicality of her work, the process starts small: “I do a lot of drawing first,” the 33-year-old RISD and Yale grad says. “Eventually, those sketches take shape and a painting begins to emerge.” The show, though comprised of a relatively small number of works—two earlier pieces, one of which is a deeply personal homage to the Twin Towers, and six large and small-scale portraits inspired by Paradise Island tourists—fills the Brooklyn gallery with a colorful and, as I can attest to, very participatory vigor. 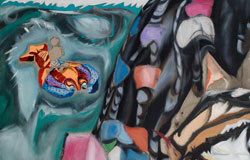 A uniquely captured middle ground between figurative commentary and abstraction, Singh’s works are thought provoking and intensely meaningful (the tropical setting for this collection is intended “to take us to a purgatorical space of contrived paradise”) without being intimidating or abstruse. And to boot, they’re also visually stunning, with pockets of curious detail (my favorite was a pair of small goats on either side of the subject in the 2010 portrait, Bob) worked into unexpected square inches of the canvas.